Time Warner Center Bomb Was Delivered By Courier, Suspicious Package Also Mailed To Rep. Maxine Waters - Joe.My.God. 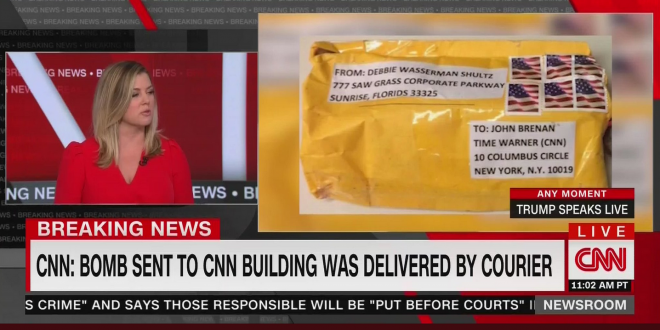 The package sent to the Time Warner Center was delivered by courier, law enforcement sources tell CNN. It was addressed to John Brennan, the former CIA director, and “Time Warner (CNN).” CNN previously reported that the package addressed to George Soros was put in the mailbox, not mailed, according to a separate law enforcement source. In a mid-day press conference in front of New York’s Time Warner Center, New York Gov. Andrew Cuomo said that his office was sent a “device.” An NYPD official now says the suspicious package in question has since been deemed safe. The source describes it as an informational package that contained literature. A Capitol Police source tells CNN that the Capitol Heights, Maryland facility, where a suspicious package was intercepted this morning, processes mail for members of the House. Two sources tell CNN that Maxine Waters was the intended recipient of the package intercepted at the sorting facility.